Through the first six games of the series, both teams had each scored an exact aggregate of 610 points. Majority of the games resulted in blowouts. But they were dead even until the 53-second mark of the final frame of that epic do-or-die game 7, just before Kyrie Irving drained that long range bomb to finally create separation from the erstwhile defending champions. Golden State's shock troopers outscored their counterparts to a whopping 45-10 in the opening salvo of this seven-game series. As a team, the Cavs shot 7-of-21 from long range in Game 1. They were averaging a league-best more than twice makes than that throughout playoffs before that - even better than that of the splash brothers and company. The Cavs were even worse in game 2, making only 5 of 23 attempts. The Warriors, on the other hand, made 15 of their 33 attempts from the rainbow territory in Game 2. Thirteen of those 15 makes came from the trio of Draymond Green (5), Klay Thompson (4), and Steph Curry (4). Unlike the Cavs, the Warriors have not had much difficulty finding offense. Warriors head coach Steve Kerr got some production on the scoreboard from 9 and 11 of his players in games 1 and 2, respectively. With their backs against the wall and against all odds, Cleveland stormed back and made the impossible possible. Down 3 games to 1 and playing in hostile territory, LeBron James and Kyrie Irving both scored 41 points apiece in Game 5 to narrow the gap to just 1 game. It also didn't help the Warriors that Draymond Green, arguably their most valuable player for this series, had to sit it out to serve a one-game suspension. Adding to their woes was the crucial injury to Andrew Bogut. LeBron James was superb. There was never even any doubt that he was the Finals MVP, leading all players from either team in all major statistical categories – points, rebounds, assists, steals, and blocks… a first in league playoff history regardless of series length. His desire was relentless... his focus, laser-like... and his approach, methodical. With Andrew Bogut, the Warrior's only legitimate rim protection, out of the picture, the four-time league MVP, along with Kyrie Irving and the other sidekicks, attacked with no let-up in games 6 and 7. Surely, Cavs head coach Tyronn Lue had a major hand in this. While Steve Kerr's splash brothers and company fell in love with the 3-point attempts, LeBron James and his cohorts settled for the high percentage shots much closer to the rim. In the sudden death game 7, versatile bigman Draymond Green drained all five of his tries from beyond the arc, leading all scorers at halftime with 22 points to his name. The Dubs led 49-42 at the turn, but the Cavs were ahead in all other departments, masked by the huge disparity in their 3-point conversions. Lue must have realized that all they had to do was to continue what they were doing. Shots will eventually fall for them and the law of averages will eventually catch up on their opponents… and it did. The Cavs made only 1 out of 14 attempts from behind the arc for a measly 7.1% accuracy from deep in the first half, but made 5 of their next 11 tries thereafter. The Splash Brothers, on the other hand, went for a combined 6 for 24 from the rainbow territory for the entire game. 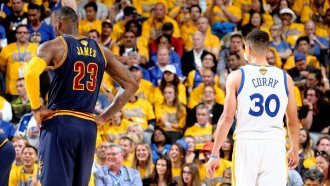 Over the course of the season, a lot of debate revolved around 4-time league MVP LeBron James and reigning back-to-back MVP Steph Curry as to who among them is the game’s best. At the end of the day, the pride of Akron, Ohio left little doubt, or nothing at all, who was king. When it mattered, LeBron James stepped up big time on both ends. The same cannot be said of Steph Curry, who struggled mightily. LeBron went on to deliver on his promise – a championship trophy to the city of Cleveland. This is his legacy. Ending the 52-year championship drought erases the stigma of his controversial departure… even if he decides to leave again. P.S. Here’s a shout out to diehard Cavs fans Gener Añora, Nelson/Ethel Guia, and the rest of the Cavs Nation in Folsom, California. Congratulations!